In this companion volume to A Wrinkle In Time (Newbery Award winner) and A Wind In The Door fifteen-year-old Charles Wallace and the unicorn Gaudior undertake a perilous journey through time in a desperate attempt to stop the destruction of the world by the mad dictator Madog Branzillo. They are not alone in their quest. Charles Wallace's sister, Meg--grown and expecting her first child, but still able to enter her brother's thoughts and emotions by "kything"--goes with him in spirit. The book is as good as I remember when reading it in paperback. 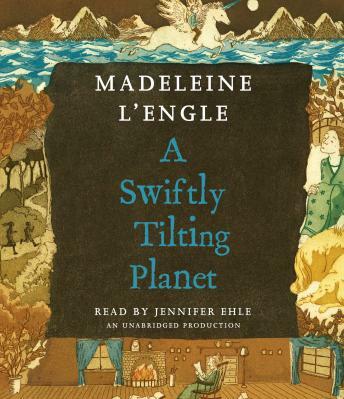 I love L'Engle as the narrator because she was so passionate. The author made a mistake in narrating her own book. Her voice is so monotone and her apparent speech impediment is so distracting, we stopped listening after only a few chapters and sent it back. I couldn't even begin to review the writing style and the storyline - I heard so little of the actual because of the annoying voice. I read these books several years ago and loved them. But when I heard the author read this, I returned it after one disc. YIKES! She was so enamored with her own words, that it was embarrassing to hear her caress them in public. If you like to read this book, don't check it out on disc.